plot-IT BUNDLE DEAL includes 1 roll of A1 80grm Plotter Paper. 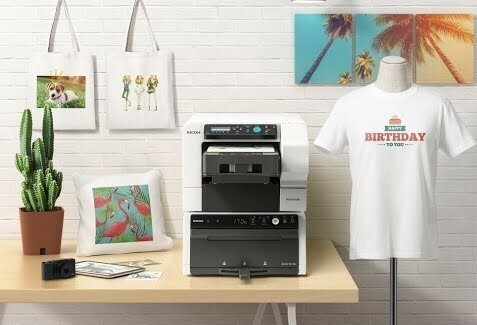 The HP Designjet T120 A1 plotter / printer with Wi-Fi connectivity & producing stunning colour results from either an online A1 / A2 roll feed or sheet tray. This four colour CAD plotter is capable of delivering high quality Graphics as well as quick mono plots and at a fraction of the cost of older HP Designjet Models. It is ideal for printing CAD / Construction drawings. Convenient Connectivity - With Fast Ethernet (100Base-T), certified Hi-Speed USB 2.0 & Wi-Fi all as standard. 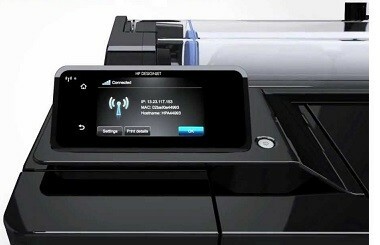 •If you’re on-the-go, attach your document to an email & send it direct to your printer via HP ePrint. 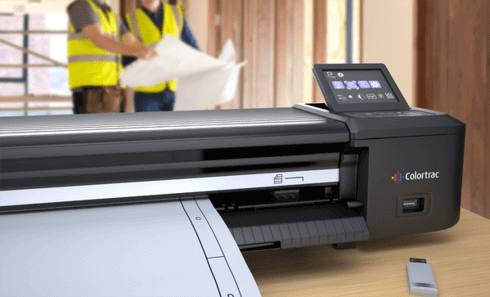 Ideal for users who wish to plot A1 A2 or even A3 wide format drawings and have the versatility to be able to print A4 word docs as well via the handy rear mounted sheet tray which holds up to 50 sheets. Media loading choices include an online 50 meter front loading roll feed, A3 - A4 cut sheet tray and manual bypass, with a diverse choice of medias. 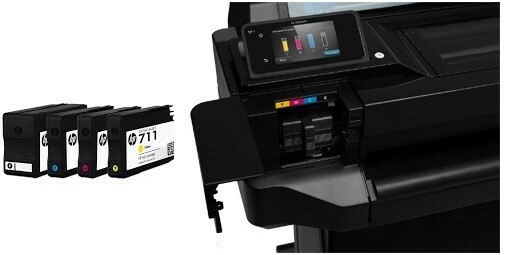 Ink Cartridges can be quickly replaced from the front and simply slide in to place. with a choice of an 80 ML High-Capcity cartridge or 38 ML Black and with Cyan, Yellow and Magenta in 29 ML which can be purchased in singles or a multi-buy pack of three of each colour. Ink levels are displayed on the control screen and on your desktop. 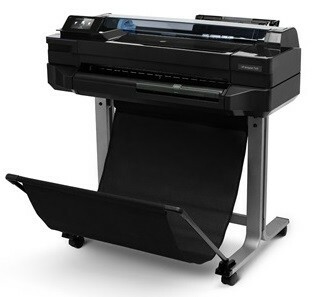 Extremely lightweight at under 30 kilos (when roll loaded) the T120 can easily be sat on a suitable shelf or desk, alternatively you can order the optional stand and print catcher if desired. NB The stand is included with the T520 but is purchasable with a T120. 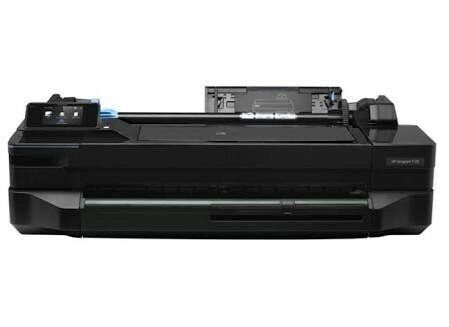 Similar in appearance to the HP T520 - Key differences with T520 - 1200dpi output (higher 2400dpi on HP T520) and quick output at up to 40 A1 prints per hour (T520 - 70 A1 per hour), 256MB memory (not Upgradeable, T520 is 1GB) no HP/GL (Standard on T520). 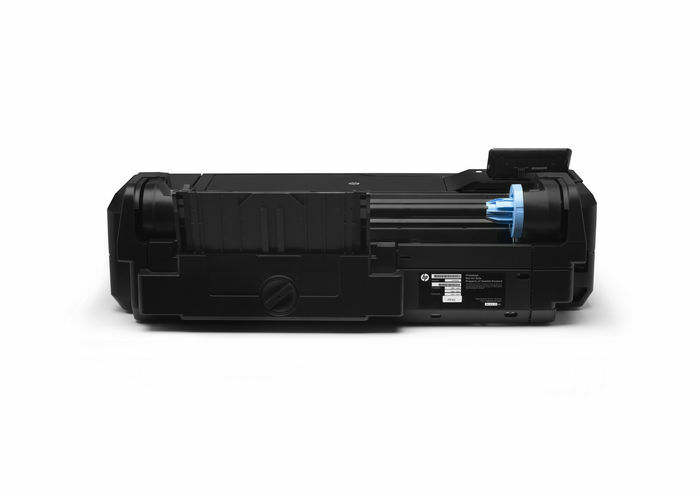 The T520 ships with the stand in the box and has the clear roll cover shown above, so some compelling reasons to look at this as an alternative option. 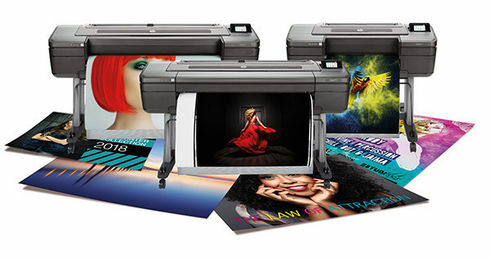 The HP Designjet T120 is probably one of the most succesful product launches from the HP wide-format team. The T120 essentially brought a new benchmark to entry level in house CAD plotting, offering a functional and affordable solution rich in features. 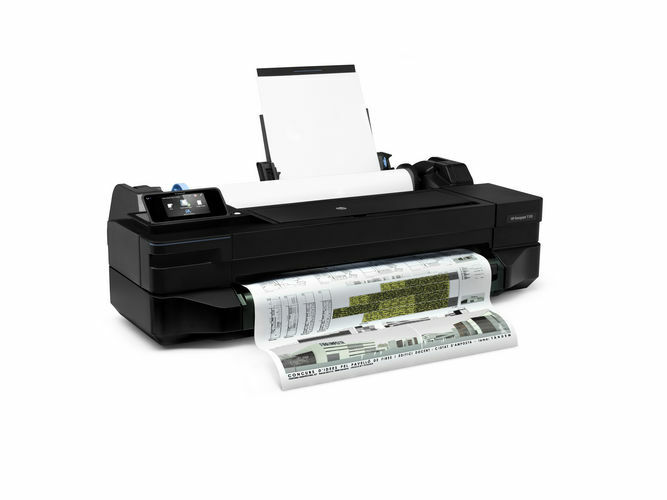 Sitting squarely as an entry level product this A1 / A2 plotter is ideal for very small work groups of 1-3 users or where wide-format printing needs are occasional. The compact design allows it to sit on a users desk or even on a sturdy wall shelf. Wi-Fi is standard, at launch we were concerned that the Wi-Fi would struggle with bigger CAD files, this for the most part has been unfounded unless your application deals with very big files then you should be mindful that you are better off with a cable connection and you should also consider the memory of the T120 which can not be upgraded. When it comes to low volume use but where big files are required then the T520 should be considered which comes with 1GB memory rather than the 256Mb supplied with the T120. In addition to offering more memory the T520 also ships with the stand, for the T120 this is purchasable seperately and with an RRP of around £150 + VAT the price difference between the two models is narrowed considerably. 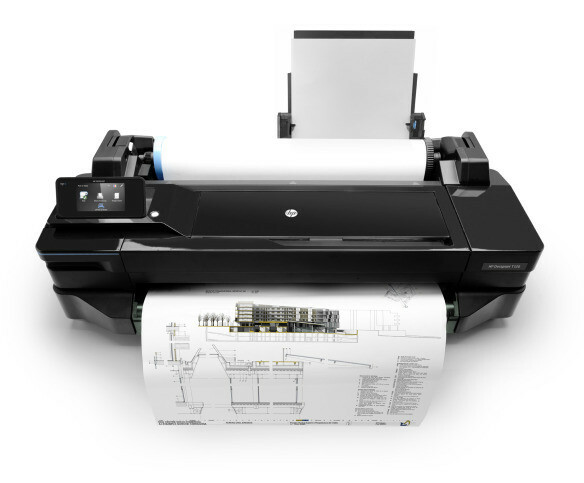 On many forums and reviews you will see the T120 is capable of providing "Stunning Graphics" this is true, it really does but bare in mind it has very small ink cartridges and if you intend to print full colour graphics then the T120 is not the right choice for you, but it's ideal for Architectural or engineering line drawings with some solid fills and it's ok if you want the odd full render. 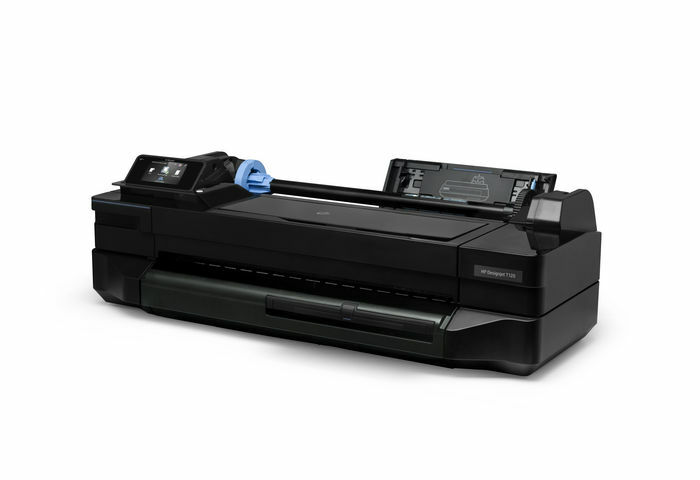 If your looking for an A1 plotter for a bigger work team, where you are using memory hungry applications or where you want to print PDF's without opening them before printing (IE Batch Printing multiple PDF's in one go) then the T790PS should be your choice, this unit features six colours (CMY, Matte Black, Pigment Black and Grey) alongw ith a longer roll length of 91 meters and the inks are much better value for money as well as being more efficent - especially for lots of monochrome work. One Year Parts and Labour onsite - Upgradeable to 3 or 5 years. Brilliant value, ideal for Students or occasional users whom require bigger than normal documents.